Baby boomers are often portrayed in the popular press as a monolithic group of individuals who behave in roughly the same ways and possess the same attitudes. But do these observations hold for all boomers? Or are they emblematic of just some? Recent Gallup analysis of boomers’ personal spending patterns suggests that these patterns vary more than stereotypes suggest. These differences matter most to marketers who hope that boomers are finally re-opening their wallets after the global financial crisis and will spend some of their discretionary income with their companies. The global financial crisis hit baby boomers particularly hard. According to Gallup Daily tracking research, self-reported daily spending among Americans aged 50 to 64 years old (roughly the ages of the baby boomer cohort) reached a low of $55 in March 2009. About one year earlier (February 2008), daily spending in this group had been at $114. By last December, this cohort’s daily spending had rebounded to a five-year high of $105 per day. 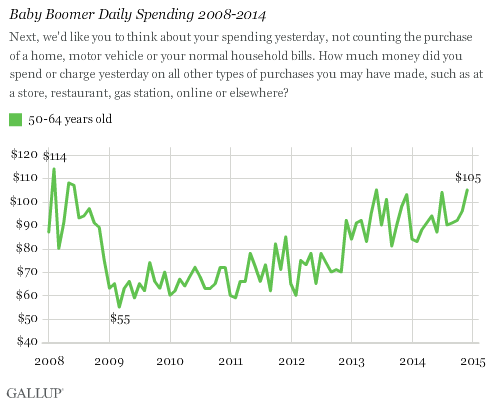 Nonetheless, the trend suggests that the daily spending among boomers has been increasing since bottoming out in 2009. 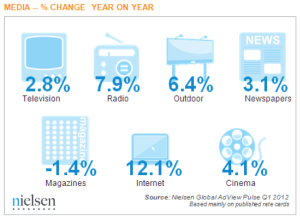 But exactly what are they spending more on? Gallup research conducted last spring revealed that while 45% of U.S. consumers reported that they were spending more than a year ago, their increased spending was on household essentials, including groceries, gasoline, utilities and healthcare rather than on discretionary purchases such as travel, dining out, leisure activities, consumer electronics and clothing. About four in 10 baby boomers (44%) in that same study reported that they were spending more than a year ago, and their increased spending followed the same pattern — more on things they need, not on things they want. According to demographers, there are really two different cohorts of baby boomers. “Leading-edge” boomers were born between 1946 and 1955 and came of age during the tumultuous Vietnam War and Civil Rights eras. “Trailing-edge” boomers were born between 1956 and 1964 and came of age after Vietnam and the Watergate scandal. In general, a higher proportion of leading-edge baby boomers report that they are spending more today than a year ago compared with trailing-edge boomers. 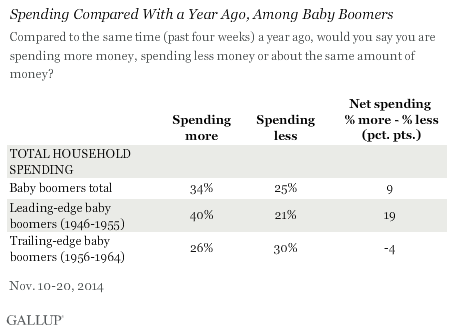 Net spending change — defined as the percentage of consumers indicating that they are spending more today than a year ago minus the percentage saying they are spending less — is positive for leading-edge boomers but negative for trailing-edge boomers. This 23-percentage-point gap between the cohorts means that more leading-edge (older) boomers are spending more overall and more trailing-edge (younger) boomers are spending less. The healthcare industry added 44,900 jobs last month, contributing to the nation’s 271,000 new jobs in October, according to the most recent jobs report from the Bureau of Labor Statistics. This is an increase from September’s numbers, when healthcare added 34,400 jobs. Over the past year, healthcare has added 495,000 jobs. Within the healthcare industry, hospital employment grew by 17,800 jobs in October. However, ambulatory healthcare services added the most, with 26,900 jobs. Most of those came from physician offices (8,300) but outpatient care centers (1,700) and home healthcare services (8,100) also contributed.